We’re gearing up for the Hydra Summer Bash, in which we’re giving away Kindle versions of 30 or so of our books (“we” being my publisher). 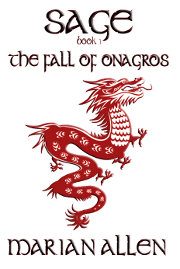 One of the freebies will be The Fall of Onagros, Book 1 of Sage. Here’s an excerpt from the point of view of Devona the scribe when she, her husband, Darcy, and their “daughter” (actually their foster daughter) arrive in the capitol city. A door opened and a man came out. He was as grim and imposing as the house. He neither smiled nor frowned, but dipped his head in the briefest bow. His blue-black hair was straight and fell to the middle of his back. His high cheekbones and large-knuckled hands looked carved of chestnut-colored rock. The man introduced himself as Lord High Chamberlain, Rhu beren Robia, and he eyed Devona’s husband with as much distaste and suspicion as she used on him herself. Rhu beren Robia bowed to Devona. Why would the Lord High Chamberlain interest himself in us? Because he was ordered to? Because he knows who Elsie really is? Then Elsie clambered down from the cart. One corner of the Chamberlain’s mouth curled up at the corner, and Devona’s image of him as stony was forever gone. Elsie could look like her mother, and he sees it. He looks at the child with tenderness. She thought herself wrong, when Rhu stopped visiting. She thought herself right again when she saw him with Elsie at Darcy’s installation as Roll-Keeper of the Realm. Darcy set her straight about that, though. He pumped Elsie afterward about what the Chamberlain had said, and if the Chamberlain had mentioned Father. Elsie repeated Rhu’s support of Devona’s protective control, and Darcy laughed at him for supporting something Elsie didn’t like. If Rhu were the man Darcy feared and lived to please, Darcy wouldn’t laugh; he would change his own opinion and tie himself in knots trying to maneuver Elsie into changing hers. Yet the Chamberlain was fond of Elsie. Of that, Devona was certain. His very disdain of the girl’s behavior as Darcy’s work bore fruit echoed Devona’s own disdain, and Devona’s was born of love. Could it be love, then? A prospective suitor’s love? Elsie could do worse – much worse, Devona thought – than marry a man whose integrity shone from his skin like candlelight through parchment. In opposition, marriage to the Chamberlain would take Elsie into the castle itself, and Devona did not share Darcy’s desire to crawl into the royal pocket. A WRITING PROMPT FOR YOU: A family friend disapproves of the way a child is being raised. Oh, I’ve met a few little heathens that NO ONE has appeared to have reared! Most of them belonged to what I call the Natural People (Wiccans, Midwifes, and the like). Now don’t look at me like that if my familiarity has bred something like contempt. I’ve earned it. Natural People stole at least three of my outdoor cats (Sent them to the pound,actually), and one allowed its offspring to clamber all over a poison ivy infested fence just to prove to me that I couldn’t tell her child what to do.